It started on a black and white TV from Eatons department store. The brand was Viking, their house brand. I remember that tube TV used to take a while to warm up, and when you switched it off the picture slowly disappeared into a small white dot in the middle of the screen. There was only one speaker, no cable channels, and the signals were collected by a “rabbit ears” antenna—that was how I was introduced to the original Star Trek series in the early 1970’s when I was a child. Even with that humble TV set, the stories of Star Trek came through to my young mind and heart as crystal clear as in the latest HD, sparking my imagination from then on. The episodes thrilled me, at times scared me, amused me, and made me wonder about unknown things and possibilities. With plays set in space, I found real lessons about life on Earth. Star Trek started a fire in me, and also in the world at large. I thought a lot about outer space and travel to the stars, years before I was old enough to drive a car. Those tales are surely part of the reason why I write science fiction today. I liked Captain Kirk because he was the Captain, and he did alright with the ladies (both human and alien). But there was something strange and deeply intriguing about the man in the blue shirt with the pointed ears and weirdly cut black hair: Mr. Spock spoke to the outsiders, the ones who didn’t feel they fit into a world not of their making. For a supposedly cold and mostly logical character, only half-human, I found a lot of feeling in Spock’s portrayal. It would be years later until I came to appreciate what he stood for more deeply. As I grew up and the TV sets in our house got better, I kept watching Mr. Spock through the years. 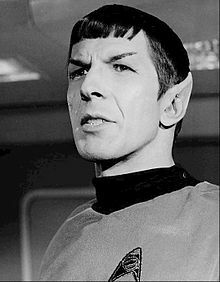 I learned there was a real man behind the character of Spock, indeed there were real people behind all of the characters I’d grown fond of on-board the Enterprise (and even some of the aliens, too). I found out the ships were not real but only TV and movie sets. They were not in space but on movie lots. And the actors behind the characters aged as I aged, too. When Leonard Nimoy passed away on February 27, 2015, I felt a bit of shock. A part of my childhood had ended, I felt. In fact, Spock had been there through most of my life and now he was gone. There would be no more movies or TV shows with Mr. Spock in them, I had to accept. I still had the action figures, toys, cards, comic books, videos and other stuff of Star Trek from the years, but there would be no more new appearances by Mr. Nimoy. I felt sad about that and also blessed, as I remembered how much he had given to the world. He kept being Mr. Spock long past the point of needing the money and that says the world to me. His work lives on and will prosper, of that I have no doubt. They just don’t make them that like anymore.